BuskNY is looking for folks with a few minutes to spare for performer outreach. It’s fun and low-commitment (0-3 hours per week, as you wish). Most of all, it’s a chance to hear great music. The key duty is direct outreach — i.e. chatting — with the performers you cross in the subway. You can read more on Idealist. To get involved, simply RSVP on Facebook for our training event next Monday, December 15 at 6:45 at 224 W 29th St, 14th floor. There will be snacks, and participants will receive free “We Are Culture” t-shirts. 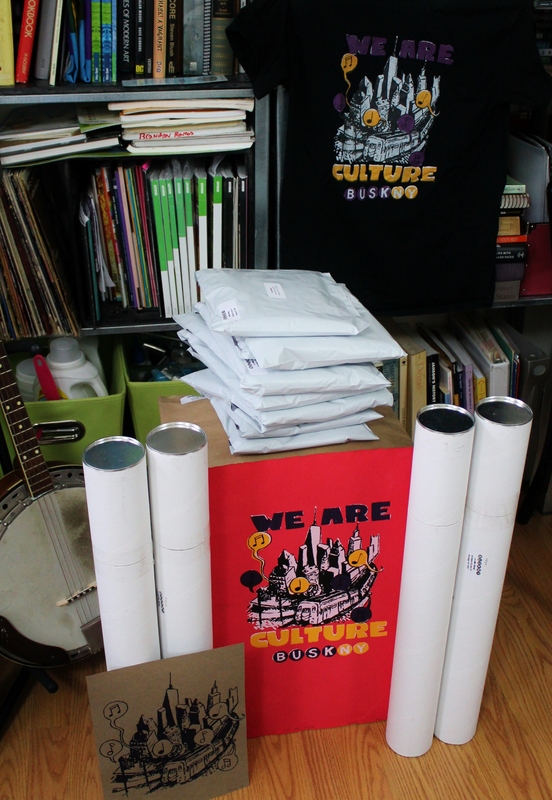 In other news, we’ve prepared our Kickstarter rewards for shipping. Those of you who backed our campaign can expect them to arrive soon, and anyone who missed out can still buy one for $25 — just email me at milo@buskny.com.